Tired of preparing the same old same old?….allow your palate to experience this taste of Italy. This one-pan dinner makes use of an easy, foolproof technique: baking chicken breasts with fresh vegetables. Here, the garlicky cherry tomatoes keep the meat moist and tender while also imparting tons of flavor. Plus, it’s a total time-saver! To keep things strictly Paleo, omit the sprinkle of Parmesan cheese when serving. Preheat oven to 400 degrees.Toss cherry tomatoes, oregano leaves, and garlic cloves with olive oil in a baking pan and roast in oven, 35 minutes. Remove pan from oven, place chicken breasts on top of tomatoes, and sprinkle with salt and pepper. Add olives and roast for 15 to 20 minutes until cooked through. 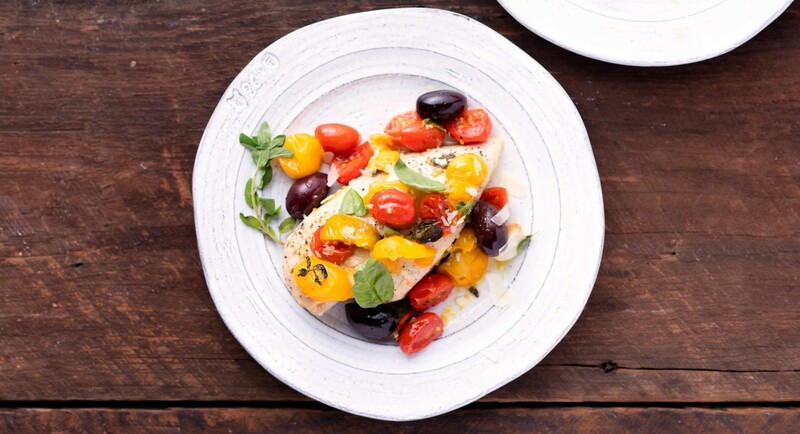 Plate chicken breasts with the cherry tomato sauce, fresh basil leaves, and a hint of grated Parmesan, if desired.